Bring Joy To A Child This Christmas! 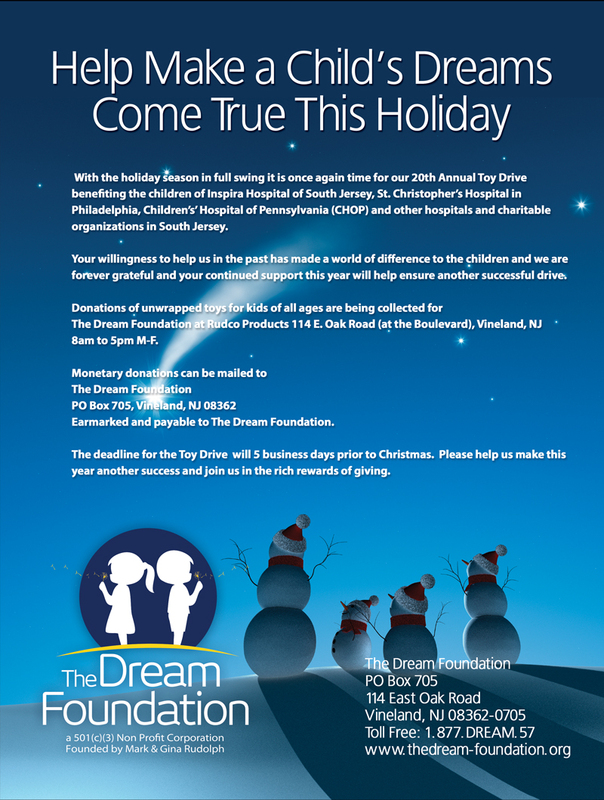 With the holiday season in full swing it is once again time for our 20th Annual Toy Drive benefiting the children of Inspira Hospital of South Jersey, St. Christopher’s Hospital in Philadelphia, Children’s’ Hospital of Pennsylvania (CHOP) and other hospitals and charitable organizations in South Jersey. Your willingness to help us in the past has made a world of difference to the children and we are forever grateful and your continued support this year will help ensure another successful drive. Earmarked and payable to The Dream Foundation. The deadline for the Toy Drive will 5 business days before Christmas. Please help us make this year another success and join us in the rich rewards of giving! The Dream Foundation would like to thank the following locations for generously assisting with the collection of toys for our 2018 season. Please stop by any of the locations listed below and help make a child’s Christmas even more special. Thank you for your support! © 2019 The Dream Foundation.